Dedicated teacher Whitney Maxwell gave up her dream of a family years ago. 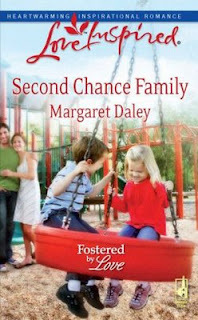 But she's about to get a lesson in faith and family from an unexpected source—a brave little boy named Jason. Jason and his dad are dealing with his autism the best they can, but Dr. Shane McCoy can't put his tragic past behind him. As Whitney and Shane work together to help his son, could these two lost souls open their hearts to love again and become a lasting family? "This is not negotiable. My son will attend your school, starting this Thursday." After dealing with a suicidal teenage girl most of the night, Dr. Shane McCoy didn't need this. "We aren't equipped to deal with him. Jason should go to Eisenhower Elementary where there's a class for children like him," the principal said in a tight, highly controlled voice. The woman's last sentence shredded what composure he had. Pacing his bedroom, Shane plowed his fingers through his hair and tried to remain calm. He gripped the phone. "You've known he would attend for months." The rumble of thunder in the distance drew him toward an upstairs window at the front of his house. Jason didn't do well in thunderstorms. Please, Lord, don't let it rain— not today. He drew back the drapes and searched the sky. Dark clouds raced toward the east, away from his house. "We've tried to find the right staff to handle your son, but…" The woman paused, taking a deep breath. Jason appeared on the sidewalk leading from his house. What was he doing out front? Going to get the newspaper for Aunt Louise? "But there aren't—" the woman continued on the other line. When his son ignored the paper lying in the grass, concern shot through Shane. He hurried toward his door. "I'll be there for the meeting this afternoon. I've got to go," he said, and clicked off the cell phone. As the question intruded into Whitney Maxwell's mind, her long hair whipped across her face, momentarily obstructing her view of the street she drove down. To the right of her someone's frantic tone pierced the early morning air. Whitney fought the wayward strand, finally managing to hook it behind her ear at the same time her gaze riveted to a sudden movement. A child disappeared between two parked vehicles ahead of her, a second later reappearing in the path of her car as he raced across the road. Clenching the steering wheel of her convertible Volkswagen vehicle, she jerked to full attention and slammed on the brakes. Not soon enough. Without thought Whitney swerved her VW to the right. Into a big SUV. The sound of crunching metal drowned out the thundering of her heartbeat in her ears. When she was thrown forward, her seat belt halted her progress. The strap cut into her chest, disrupting her shallow breaths. Almost to the other side of the street near a yellow trash can, the little boy stopped, pivoted and came straight toward her. When he reached the crash, he slid his hand over the smashed hood of her car, his gaze glued to it. "Jason! Jason!" the woman screamed, her view blocked by the big SUV. The little boy looked up, cocked his head, then whirled around and ran back the way he came—straight into the arms of the older woman who rushed between the parked vehicles. Whitney stared into the lady's pale face as she quaked and hugged the child to her. Everything happened so fast—only seconds—that Whitney's head spun. Her hands shaking, she fumbled for the handle. She shoved the door open, swung her legs to the pavement and stood. The thought of the near miss shuddered through her. Her legs weak, she started to sink and clutched the car to steady herself. She needed to check on the little boy and the older woman, but her whole body quaked. Drawing in several stabilizing breaths, she made her way to the pair now on the grass between the sidewalk and the street. The older woman, tears in her eyes, held the child away from her. "Jason, you cannot run out into the street." Yellow? What's the child talking about? "Wanted to touch. So pretty." Whitney glanced toward the trash can then at her yellow Volkswagen car. Her steps faltered at the implication of what could have happened. Thankfully she'd only been going twenty-five miles per hour because the child had been oblivious to the danger involved, and yet he appeared to be at least six or seven years old. The sounds of a slamming door and pounding footsteps nearby drew Whitney's focus toward the house in front of her. A large man, over six feet tall, jogged across the lawn toward them. His intense gaze first took in the child and woman, then slipped to Whitney hovering a few feet from the pair. It skimmed down her length before moving away. When his appraisal connected with her Volkswagen bug, a frown carved hard lines into his face. "Jason—" the older woman whimpered the name, tears streaking down her face as she clung to the child. "He— he…"
After patting the woman and whispering, "It's okay. I'll deal with this," the man fixed his gaze on Whitney and strode toward her. "What happened?" His question frosted the air between them. She straightened, her hands clenched at her sides. "The little boy ran out into the street from between these two parked cars." She gestured toward the vehicles. "I had to swerve to avoid hitting him." His color drained from his face. He glanced over his shoulder at the boy and the older woman. The child tried to pull from her embrace, his arm outstretched toward Whitney's VW "Aunt Louise, can you take Jason inside? I'll be there in a minute." When the pair was on the porch, the man turned back to Whitney. "I'm so sorry. Are you okay?" His cultured voice held a smooth, calmer tone, meant to put a person at ease. Concern—directed totally toward her— darkened his green eyes. "Better than my car." She flipped her quivering hand toward her convertible. "I ran into someone's SUV. I—"
"Don't worry about that. It's mine. Cars can be fixed much easier than people." He walked toward the back of his vehicle and examined the damage. When he looked at hers, he whistled. "Yours will be more involved." "Yeah. It's sorta like a beetle slamming into a wall." Where was she going to get the money to pay for this? Even if the man could take care of his SUV, her car repairs would cost a lot and with a five-hundred-dollar deductible—money she didn't have—she had no answer. She would not accept any more help from her older brother. She'd always managed to make her way in the world by herself. She wasn't going to let this change that. She would figure out something. After rounding the back of her vehicle and inspecting the crash from all angles, the man came back to her side. "I see what you mean. I'll take care of your car." "No, I crashed into your SUV." "But if you hadn't reacted quickly, my son would have been hit. I owe you. I'll take care of it." He stuck his hand out for her to shake. "Shane McCoy." "I'm Whitney Maxwell." His warm, firm clasp conveyed a man who took charge of situations and solved problems. Her defenses quickly went up. "Yes, you know my brother?" "I've been working with Stone's Refuge ever since it began. And since he's on its board, we've gotten to know each other these past few years." Now that she was thinking somewhat rationally, she remembered Noah talking about a Dr. McCoy seeing some of the kids who lived at Stone's Refuge, a place for foster children who needed help. "You're the child psychologist." Then she recalled her brother mentioning how much Dr. McCoy had helped his adopted son. "The one who worked with Rusty." "Your brother was the best thing that happened to Rusty." "I think my nephew would agree. Noah's taken to being a dad." Although she had discovered she loved children since returning to Cimarron City, she never saw herself as a mother. She never wanted to disappoint a child like she had been. "Come in and I'll call a wrecker to take your car to a shop I know that does excellent work for a fair price." Shane McCoy had everything figured out. She fortified her defenses. "I'll drive my car to school and come up with something." He shook his head. "That car isn't going anywhere without a wrecker." Whitney did her own examination of her VW and noticed the front hood was crumpled into her right tire. He was correct. Although the school was about two miles away, maybe she could walk and still make it on time. She glanced down at her watch and winced. That wasn't an option if she wanted to be on time or at least only a few minutes late. "You mentioned driving to school—the university?" "No, Will Rogers Elementary School." "A teacher's assistant." If all her plans worked out, she would be a teacher in three years. "My son starts kindergarten there on Thursday. We've been marking off the days until school starts. So since I was going there this morning anyway to show Jason around before the meeting there this afternoon, I can take you. That's the least I can do." She looked down at the damaged hood. "Fine, but I need to call a wrecker then the school to let them know I'll be a few minutes late." She hated being late her first day on the job, but there was just so much help she would accept from Shane McCoy. "Are you sure I can't arrange for a wrecker to take your car to Carl's Body Shop?" "I'm sure." If she had been paying better attention instead of looking for Zoey Crandell's house, maybe she would have seen the child racing across the lawn toward the street. But ever since she'd made the decision to move out of her brother's guesthouse, her attention had been focused on finding an apartment, and Zoey's sounded perfect for her. "You can call inside while I prepare Jason to leave now." "Prepare?" slipped out before Whitney could stop it. Jason didn't act like a normal kindergartner. What was wrong with him? "It won't take long. I just have to prepare my son for something a little different. He already knew he was going to the school today." Shane started for the large Victorian house, stopped and said, "My aunt makes a great cup of coffee. Would you like some?" "That sounds good." Whitney reached into her VW and grabbed her purse and the classified section of the newspaper she'd brought with her. Peering at a circled ad, she noted the address she'd been searching for and the reason she was on this particular street. "Do you know Zoey Crandell?" she called out to Shane. He paused a few steps away from her and swung back around. "Yes, she lives at the end of this block." He pointed toward another Victorian house five away from his on the other side of the street. Whitney noticed he wore a wedding ring and wondered where his wife was since it wasn't much after seven. "I wanted to get a peek at the garage apartment she had advertised for rent," she said when she saw the question in his eyes. "That's right. She does rent that out. I didn't realize her tenant left." "No, but she's a good neighbor. She goes to my church." Shane started again for his front door. As Whitney ambled toward the house, she thought about the little boy she'd almost hit. Her earlier question crept again into her mind. Was she making a mistake? Maybe her wanting to be a teacher wasn't what she should do with her life. Before coming back to Cimarron City nine months ago, she would never have dreamed of becoming a teacher and not all children were like her niece and nephews. Ones like Jason would be a challenge. Could she deal with that? She couldn't get the image out of her mind of the child coming out between the parked vehicles so suddenly, then after she had crashed, walking over to her car and touching it. In her education classes she took at night at the university, she hadn't had the Exceptional Child course yet, but it was obvious something wasn't right with Shane McCoy's son. But wasn't that why she had decided to be a teacher's assistant? To see if she could handle the job? Inside his house Shane immediately headed toward the kitchen, which flowed into a den. Whitney followed. His son sat cross-legged on the floor in front of the television, watching Animal Planet and rocking back and forth, while he clutched a yellow cloth. "Aunt Louise, this is Whitney Maxwell, Noah's sister. I'm going to drive her to Will Rogers Elementary School where she works." His aunt smiled at Whitney then turned to Shane and said, "Are you taking Jason?" "Yeah, since later this afternoon I have that meeting at the school and I don't know how long it will last." He handed Whitney a cordless phone and the telephone book. While she placed a call to a wrecker service and the school, he poured coffee into a mug sitting on the counter then took a new one down from a cabinet and filled it for Whitney. He handed it to her as she wrapped up her second call. After taking a large sip of the brew, Shane strode toward the den area and knelt next to his son. He placed his hand on the boy's arm before he said his name. Pressing a yellow cloth to his chest, Jason slowly looked up at his dad. Shane's lowered voice didn't carry to Whitney. "He has the patience of Job." Surprised by the comment, Whitney turned on her heel and faced the older woman, slim, medium height, her gray hair pulled back in a bun at the base of her head. "Shane?" She picked up her mug and drew in a deep breath of the coffee-laced air. "Yes. It's been hard since his wife died." "Oh, she died recently?" Whitney asked, remembering the ring on his hand. "Five years ago so he's been mostly the one responsible for raising Jason. He does a wonderful job with his son. If anyone can prepare Jason for a change, it's my nephew." What happens if you don't prepare Jason? Whitney wanted to ask the question, but it was a private affair, and if anyone understood the need for privacy, it was she. That thought prompted a decision to call Zoey Crandell and set up an appointment this week to see the apartment because at Noah's estate—as large as it was—she never had much alone time. Louise released a deep sigh. When she brushed back a stray strand of hair, her hand shook. "I'm not nearly as good as Shane, hence the runaway this morning. Jason didn't like the breakfast I fixed him. We'd run out of his favorite cereal so I made him pancakes, his second favorite. I don't move as fast as I once did. He was out the front door before I could stop him. I'm so sorry for what happened. Are you all right?"